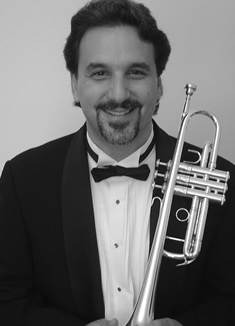 Dr. Fienberg is a trumpeter whose experiences range from the great concert halls of Europe to the orchestra pits of Broadway. His performance interests cover the complete range of possibilities for a contemporary trumpeter in classical, jazz and commercial music. He has performed with such artists as Aretha Franklin, Ray Charles, The Manhattan Transfer, Natalie Cole, Barry Manilow, The Temptations, Toots Thielmanns and many others. During a nine year residence in Europe, he worked for all of the major broadcasting companies in both the Netherlands and in Germany, performed at the acclaimed North Sea Jazz Festival, and worked with both the Big Band and Symphonic Orchestra of the Nord Deutscher Rundfunk.